The barnacle lives on the back and bellies of whales, benefiting of transportation and food. 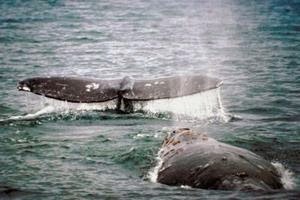 As the barnacle depends on the plankton to live, they use whales to be transported to the areas where it can be found. The whales benefit from this “collaboration”, as the barnacle cleans the whale, and it also filters the plankton that will be eaten by the whale.